This salad was on my favorite list for a long time, but I'd stopped making it for quite a few years. Recently, I became hungry for it again, so I decided to make a healthier version. It satisfied my craving! I made my own Italian dressing, but a healthier store bought version of it would also be an option. 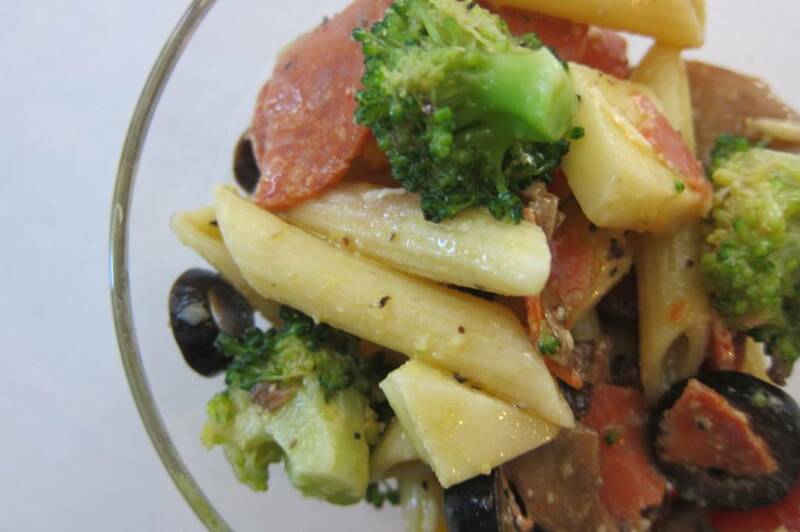 If you like pasta salad with an Italian twist, I think you'll enjoy this one! This recipe is large enough to take to a church potluck or picnic, but you can easily convert it to make a smaller amount. Although I had no leftovers for the next day, I do remember from before that the olives will discolor the cheese and mushrooms if kept too long. I like to make this recipe the day before, but add the olives not long before serving. I love salads that are easy and quick to make, yet are filled with yummy flavors. This is one of them. I hope it will be enjoyed by your family like it is by mine. NOTE: I like to make this recipe the day before, but make sure you add the olives just before serving because the olives will discolor the cheese and mushrooms if kept too long. Combine everything except the black olives. Pour enough Italian dressing to cover it well and toss. (You may not use all of it.) Just before serving, add the black olives and more dressing if needed. Enjoy!